So it's not the most photogenic dish in the world. Trust me it looked worse after it was served up. But this was delicious!!! I've never made a vegetarian moussaka before and this one was all vegetables, no fake mince, and let me tell you, even my meat-loving husband really loved it! This is a great alternative to lasagne if you are trying to cut back on carbs. Or even if you're not, it's well worth a go and perfect for this time of year. Preheat the oven to 160 degrees celsisus fan-forced. Lightly grease a lasagne style baking dish and set aside. To prepare the eggplant - slice crossways into 1cm rounds. Spread the pieces out on 1 or 2 baking trays, sprinkle each piece with salt and leave for around 20 minutes. You should see liquid on the top of each piece. Rinse them well under running water and pat dry. To make the sauce - heat 1 tbs olive oil in a large pot over medium high heat. Fry off the onion, garlic, carrot and zucchini until they are soft and any liquid has evaporated. Add the herbs, tomatoes, beans and stock powder, along with 1/2 tin of water. Stir well and bring to the boil. Reduce heat to low and simmer while you prepare the rest of the dish. Season to taste. Once your sauce is simmering you can cook the eggplant. Heat 1 tbs oil in a large non-stick frypan over medium high heat. Fry off the eggplant in batches until it has softened and is golden brown on each side. To make the white sauce, melt the butter in a medium saucepan. Once melted add the flour and cook for 2 minutes, stirring constantly. Add the milk all in one go and whisk well. Keep stirring until the sauce begins to thicken. Add the cheese, stir to combine and set aside. To assemble the moussaka, place layers of tomato sauce, eggplant and white sauce into the baking dish finishing with a final layer of white sauce. Sprinkle over the breadcrumbs and Parmesan cheese. Bake for approx 20 minutes or until the cheese is melted and everything is bubbling and golden. Allow to cool for 10 minutes before serving with plenty of crusty bread to soak up the sauce. This has a real lasagne vibe and you definitely don't miss the pasta. Hope you enjoy it! 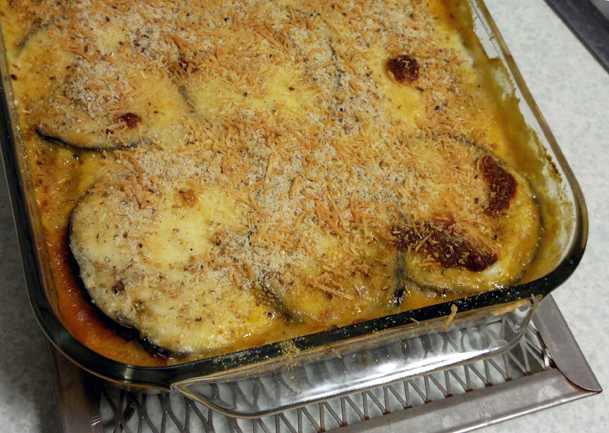 How good is veggie moussaka! I made one once and even though I'm not a fan of tomatoey pasta things, I thought it was amazing. Probably because it had a kilo of bechamel sauce on it haha.